There has always been an intersection between the process of writing and the act of painting in my work. It has somehow been my guide. In the last four years, during the making of this work, that connection intensified as I started writing short stories and flash fiction while taking online classes. I find the process of writing and painting so different in almost every way, but there is something freeing and generative in writing which helps my painting process. Or perhaps it's a reminder of what painting is for me - something intuitive that needs to be trusted. And what they do have in common is a desire to encapsulate and distill a single moment, a story, about the complexity of our emotions and experiences. At the heart of my work is the recurring depiction of perseverance, strength of will, and a subtle optimism. Symbolically through the objects, precarious situations depict a moment of possible difficulty, often involving the influence of nature. A paper crane left in the snow. 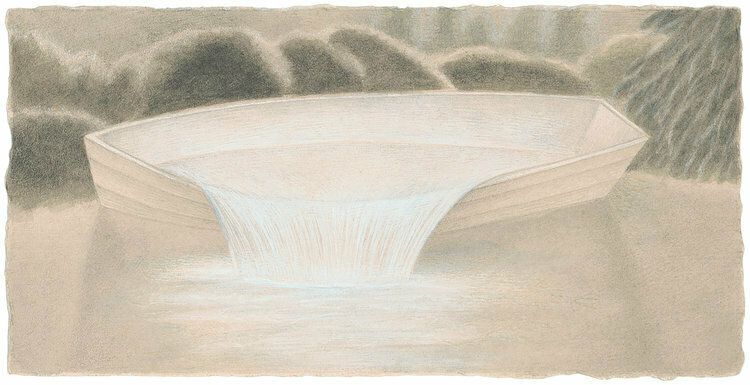 A boat nearly filled to the brim, but not submerged and able to drain its own contents carefully. A slide alone at night which will return to its purpose during the day. My intention is to not show the failure because I imagine all these objects make it through to better times. Allegories of survival. Someone comes by and finds the paper crane, the rowboat owners return and see their boat undisturbed, and the slide during the day brings joy.